My father is a humble and friendly man. He is the kind of guy that starts a jovial conversation with his neighbor while waiting in a long line at the post office. He has a fondness for people and treated customers with respect. Customers had nicknames like Mama or he would use the lingo at the time by saying, “What would you like today, my Man?” My father’s attire at the shop was almost always butcher shop white. He wore a white hat, a white shirt, and a white apron. And he drove a white truck. He was the Diane Keaton of Oakland. If you bought him a colored shirt for Christmas, it was a guarantee that he’d never wear it. Dad has mellowed a bit since then. He now drives a grey truck. The attire is still the same. His customers were his family. The relationships he built over the years have kept his customer base strong. Since the neighborhood was and still is primarily Black, he sold meat that was core to Soul food; chitterlings (pork intestines) by the bucket for New Year’s, smoked turkey neck bones, pig feet, hog maw (pig stomach), hog heads, pig ears, pig tails, hog head cheese (German terrine of made from the head of a pig set in aspic) and other smoked pieces and parts. It was good stuff but for some of it, you had to know how to cook it right. Each morning, he brought meat back to his shop and broke it down to be sold. His relocation to East Oakland meant that he was within a mile of Schaefer Meats. 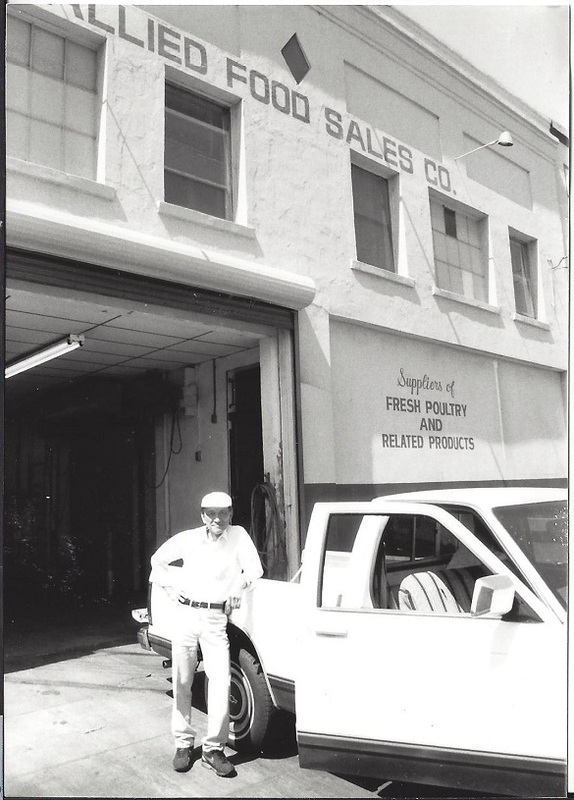 He eventually became friends with Otto Schaefer Sr., the original owner of Schaefer Meats. Otto immigrated to the States from Germany, via New Jersey when he was only 16. At the time, he was already trained as a butcher. His sister convinced him to move to California and once he did, he started working at a retail store in Oakland. 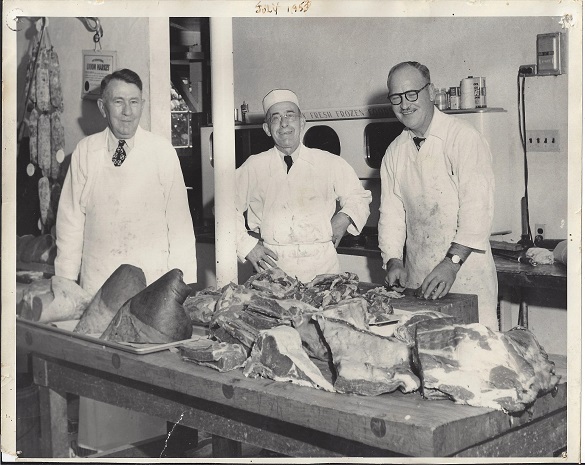 By 1941, he started Schaefer Meats out of the same shop and the bulk of their business came from selling beef wholesale to the surrounding retailers. Eventually, Otto closed the retail side, not wanting to compete with their own customers. Otto Sr. had two sons, Martin and Otto Junior who worked with their father. Otto Jr. who’s nickname is Butch would drive to local retailers like Don’s Meats and deliver order. Eventually, Butch took over the business when his father died in 1981. His brother died earlier in a tragic car accident making him the sole heir. Schaefer Meats sold mostly beef but also some lamb, pork and eventually chicken. 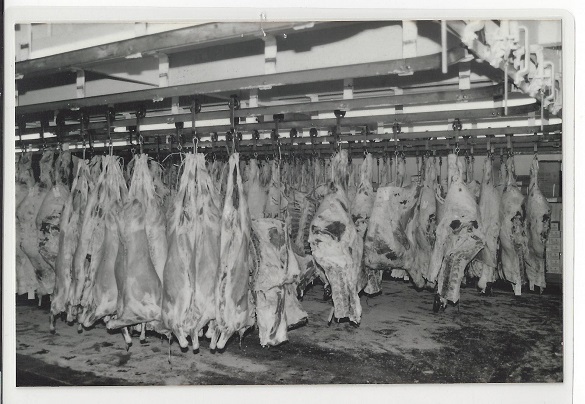 In the cold locker, one could see rows of half cows hanging from the ceiling, just like in Rocky. As Butch explains it, the head loin of the steer is divided into the top sirloin and the bottom sirloin. The bottom sirloin is made up of two parts, the ball tip on the top half and the tri-tip on the bottom. The ball tip is quite tender and good for stews; and commands a good price. The tri-tip was more sinewy and tougher. Connective tissue and fat separate the two meats. The tri-tip was often cut out and made into hamburger since it was much less desirable in texture. In part 4, I will share my story about Dad’s Blue Pontiac and how Otto Schaefer began marketing tri-tip steak. You are very kind to say that. He’s been working at Don’s meat for such a long time indeed. I know exactly what you mean. When our family gets together, we talk about the meats in the shop often. We each have our favorites: the salami, the hot version of hoghead cheese, the liverwurst with a layer of fat that goes around each square slice and how the square ones are better than the round ones. They are fond memories indeed! 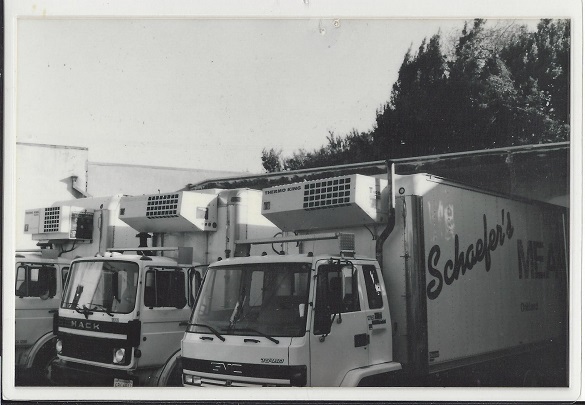 Otto Schaefer was my grandfather – what fun to find this page! It’s a pleasure to meet Otto’s grandson! Donna lives in Alameda and maybe one of these days we’ll bump into each other! My dad had a butcher shop at 73rd Ave and East 14th in East Oakland. Vital’s Meats.